The first step toward building a successful IAQ program is understanding the basics. Still not convinced? Ask your customers if they’ve had headaches, nasal congestion, an irritated throat, fatigue or other unexplained health problems. Ask also if anyone in the home has asthma, allergies, or other breathing difficulties. The EPA says these health problems could be a sign of poor indoor air quality caused by a build up of a variety of volatile compounds, some biological and some chemical. In doing so, you’ll be asking indirectly if your company can help this customer improve his or her Indoor Air Quality (IAQ). 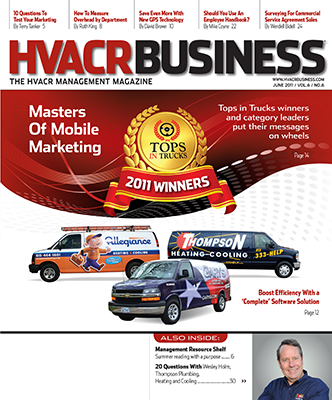 Certainly not a new concept in the hvacr business, IAQ nonetheless is still misunderstood or ignored by many hvacr contractors. Some feel that customers aren’t willing to pay for products or services to improve IAQ or that it’s not worth it to train technicians and sales staff on IAQ. The counter to those arguments is that contractors who have made an effort to promote IAQ have benefited. • An aging population, which means an increase in age-related breathing problems that can be exacerbated by poor IAQ. />• An increase in asthma in all age groups. The American Lung Association (ALA) estimates that one in five households has someone with asthma. According to the ALA, allergens such as dust mites, pollen, molds, pollution, and animal dander can trigger asthma attacks, as can respiratory illnesses. • Overall growing interest in healthier lifestyles. • A tendency to spend more time indoors. The EPA estimates that Americans now spend 90% of their time indoors. • Growing awareness of poor IAQ in commercial buildings such as offices and schools affecting the health and performance of occupants. 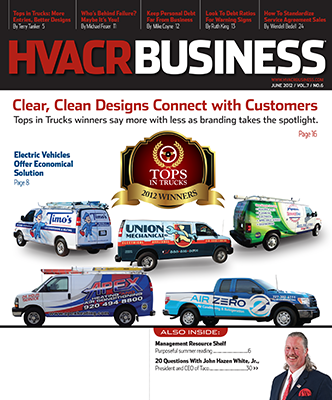 HVACR Business knows that readers have basic questions about IAQ. Following are some of those questions and responses from four respected authorities: the EPA (www.epa.org/iaq); the American Indoor Air Quality Council (www.iaqcouncil.org); Terry Townsend, 2006-2007 president of the American Society of Heating, Refrigerating, and Air-Conditioning Engineers (ASHRAE) (www.ashrae.org); and Dan Brett, president/owner of J.P. Brett & Sons, Naples, Fla., a contractor who has successfully implemented an IAQ program. Please define what IAQ means for both the residential and commercial sectors of our industry. Townsend: IAQ refers to the levels of pollutants in indoor air that can impact the health, comfort, and productivity of building occupants. By addressing the sources of indoor air contaminants, outdoor air ventilation rates, and filtration, good IAQ can be provided with a minimal impact on energy consumption. EPA: Indoor pollution sources that release gases or particles into the air are the primary cause of IAQ in homes. Inadequate ventilation can increase indoor pollutant levels by not bringing in enough outdoor air to dilute emissions from indoor sources and by not carrying indoor air pollutants out of the home. High temperature and humidity levels can also increase concentrations of some pollutants. What is the history of IAQ? When did people start talking about it? Townsend: Indoor air quality has been a concern since people first occupied buildings, with references noted in the literature of the ancient Greeks. More recently, awareness of IAQ increased in the 1970s as people’s awareness of environmental issues increased along with some ill-considered efforts to reduce building ventilation rates to reduce energy consumption. IAQ Council: The roots of the American Indoor Air Quality Council go back to October 1993. After an EPA Indoor Air Quality Course in Phoenix, some of the participants remained to discuss the need for interaction with the EPA and other governmental agencies with those involved in the field with IAQ. Their major concern was how to keep people informed on rapidly changing issues that affect IAQ. During the fall of 2002, the IAQ Council reached approximately 3,000 members, 200 corporate sponsors, and had 46 chapters in 26 states. Additional chapters are forming in several international locations. What does IAQ offer in terms of market potential? Brett: We use this concept to renew service contracts, which are about 15% of our residential business revenues. What are the big issues (problems) that IAQ addresses specifically? Townsend: IAQ concerns a wide range of problems from the annoyance associated with unpleasant odors to the control of serious health risks such as carbon monoxide and cancer-causing radon gas. A host of other problems such as mold in buildings, allergies and asthma, and reduced productivity are also relevant IAQ issues. Brett: Some of the things we address are breathing problems (solution — keeping humidity low with a whole-house dehumidifier); allergies (solution — filtering or killing allergens with filtration or UV lighting); excessive dust (solution — sealing ducts); and bacteria and mold (solution — improving air flow to prevent sweating). How should contractors educate customers about IAQ? Townsend: There is so much good information about indoor air quality in the ASHRAE literature that is targeted toward commercial customers. ASHRAE also holds conferences that address IAQ issues such as the Healthy & Sustainable Buildings conference Oct. 15-17, 2007, in Baltimore. EPA: The EPA and the U.S. Consumer Product Safety Commission provide a free pamphlet called “The Inside Story: A Guide To Indoor Air Quality,” available at www.epa.gov/iaq/pubs/insidest.html and also available atwww.hvacrbusiness.com/downloadcenter. Townsend: ASHRAE offers several educational programs on IAQ and ventilation issuse through their continuing education programs. In addition, local ASHRAE chapters are a good resource for many other educational programs. IAQ Council: The IAQA (Indoor Air Quality Association) offers training classes for workers, technicians and supervisor/managers on microbial remediation and investigation. Also offered are advanced classes for IAQ consultants and specialists. For new construction, is IAQ automatically part of the engineered systems, or is it based on what an owner wants and is willing to spend? Townsend: IAQ issues are addressed in part by complying with requirements in building codes, specifically minimum outdoor air ventilation rates. In other cases, an owner may desire other IAQ features such as enhanced filtration and lower emitting pollutant sources. EPA: For homes, the EPA offers the Web portal “Indoor Air Quality for New Homes” for guidance (www.epa.gov/iaq/homes). Links to similar portals on schools and commercial buildings also are provided. Are there regulations related to IAQ that contractors need to be aware of? Townsend: Building codes are the primary regulatory mechanism related to IAQ, though some government agencies may have additional requirements. Specific solutions to the everyday challenges of achieving indoor environmental quality within real-world budget constraints will be presented by American Society of Heating, Refrigerating, and Air-Conditioning Engineers (ASHRAE) in a satellite broadcast/Web cast. Indoor Environmental Design: Practical Solutions to Everyday Problems, sponsored by ASHRAE’s Chapter Technology Transfer Committee, will take place from 1 p.m. to 4 p.m. EST April 18. For more information, e-mail ashrae-satellitebroadcast@ashrae.org or call 678-539-1139. Two new local chapters of the Indoor Air Quality Association (IAQA) have formed in Denver and Santa Fe. This brings the number of worldwide chapters to 40. IAQA is a non-profit, multi-disciplined organization dedicated to the promotion of indoor environmental information, through education and research, for the safety and well-being of the general public. For more information, see www.iaqa.org. Healthy and sustainable buildings are the talk of the building industry, but what exactly defines what a healthy building is? American Society of Heating, Refrigerating, and Air-Conditioning Engineers (ASHRAE) will discuss this and other topics at its IAQ 2007: Healthy and Sustainable Buildings conference in Baltimore, Oct. 15 to 17. IAQ 2007 addresses what tools and metrics can be used to quantify buildings’ health and sustainability and how indoor air quality can be certified as sustainable. Plenary session speakers will compare the functionality of rating systems, how they can be improved and what information other than the ratings can developers, designers and public entities use to distinguish high-performing buildings. For more information, seewww.ashrae.org. Air Conditioning Contractors of America (ACCA) includes sessions on air-conditioning system cleaning and home performance contracting at its March 6 to 8 annual conference in Orlando, ACCA Conference and Indoor Air Expo. For more information, see www.acca.org.